Star Light, Star Bright, What Sound Do You Make Tonight? One hundred or so physicists and astronomers work in Green Bank, West Virginia to listen to the stars. Why? To map the universe. Duh. They navigate through dust and gas that obfuscate an optical telescope to determine the depth, dimension and placement of planets, stars, asteroids and other matter. It’s through sound that they learned the universe is expanding–because objects that had one sound property suddenly didn’t sound the same anymore: they were further away! There are ten new stars every year. The Big Bang left a radio signal that still resonates. I’m supposed to have a third bullet for grammar and balance but I don’t have anything else to say about space. This satellite, this mammoth thing, is not alone (are we?). There are a dozen or so other satellites on the property but none as are behemoth. They have their various important assignments, none of which are to look for extraterrestrial life–that happens elsewhere. This is the largest, fully steerable telescope and also the largest moving structure on land. The dish is 2.3 acres, the whole thing weighs 17 million pounds, and it’s taller than the Statue of Liberty. Yes, it’s been struck by lightening: 3-4 times a year! Why all this technology in Green Bank, WV? BECAUSE it’s Green Bank, WV. It’s surrounded by mountains which protects it from weather and from a lot of traffic. While not good for the communities, people are leaving the area, reducing the ambient noise and giving the satellite peace and quiet. The 38th parallel is important, but I didn’t write down why…. 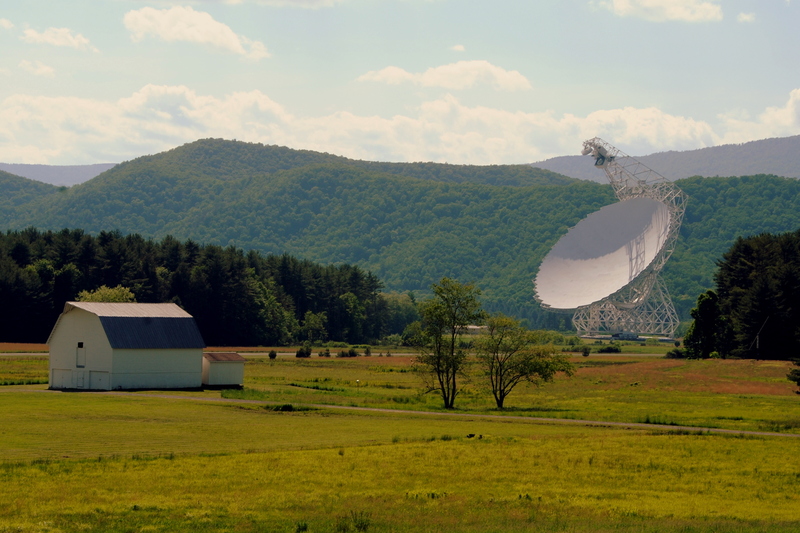 The National Radio Astronomy Observatory owns the air space for a 40 mile radius, cutting off cell phone service to preclude interference. The satellite is so sensitive they had to stop selling pocket fans in the gift shop! And a dedicated car that’s as geeked out as you can imagine with antennae facing in every direction looks for the source of interference among the remaining locals: they bought a family a new toaster because theirs had a short that was making the satellite fussy.